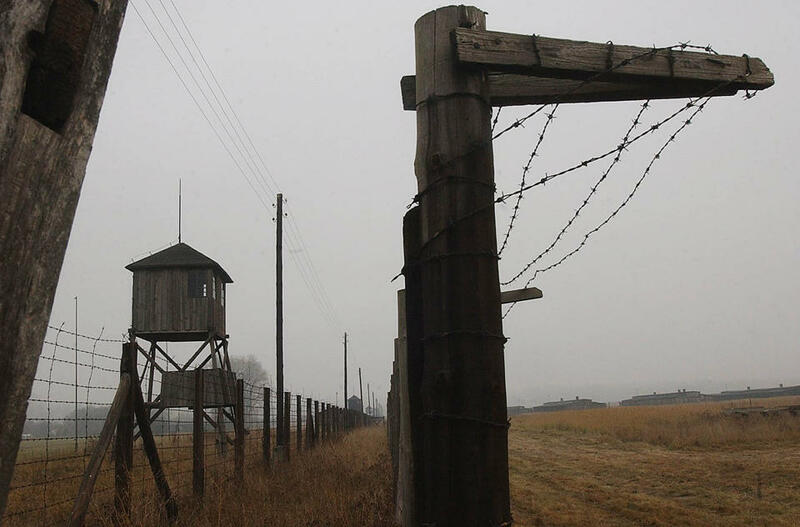 German probe finds 20 former death camp guards…..
Around 20 former guards at the Majdanek death camp could face charges in Germany, following a widespread probe of the Nazi SS men and women who served there during World War II, war crimes investigators said Tuesday. Federal prosecutor Kurt Schrimm, who heads Germany’s special Nazi war crimes office, said he expects to turn the cases over to state investigators within two weeks for them to pursue accessory to murder charges. Schrimm’s office has no power to file charges itself. Lead investigator Thomas Will told The Associated Press that about 30 suspects were identified and located, but around ten had already died. The remaining 20 men and women all live in Germany, he said, but refused to elaborate further. Some 220 others are still being investigated for possible charges but have not been located. The Majdanek probe is the second major review of death camp guards undertaken after Ohio autoworker John Demjanjuk in 2011 became the first person to be convicted in Germany solely for serving as a camp guard, with no evidence of involvement in a specific killing. Though Demjanjuk always denied serving at the death camp and died before his appeal could be heard, Schrimm’s office in September recommended that state prosecutors pursue charges against 30 former Auschwitz guards based on his case. The office then started investigating about 1,000 former guards at Majdanek — another death camp in Nazi-occupied Poland, where some 360,000 Jews and others were killed. While Majdanek was also used as a labor camp — meaning guards theoretically could have worked there at certain times and not been involved in the Nazi genocide — prosecutors focused on guards allegedly present during the killings. Efraim Zuroff, the head Nazi-hunter at the Simon Wiesenthal Center, urged state prosecutors to prioritize the new cases, given the advanced age of the suspects. “We are very hopeful that the work will be expedited so as many people as possible can be brought to justice,” he said. BENGHAZI GUARDS REFUSED TO PROTECT FLEEING AMERICANS..Senate report provides new, startling detail…. The Senate’s 88-page report on the Benghazi assault provides a new detail about the role of an al-Qaida-linked organization that provided external security to the fated U.S. special mission. According to the report, the Libyan 17th of February Brigade militia refused to “provide cover” for the U.S. security team that was trapped inside the compound. The detail was not mentioned in the State Department-sanctioned Accountability Review Board, or ARB, investigating the Benghazi attack. The ARB paints a picture of the 17th of February Brigade as largely aiding in the evacuation of the U.S. personnel at the mission. The 17th of February Brigade, which was hired by the State Department to protect the U.S. facility in Benghazi, operates under the Ansar-Al-Sharia banner. Ansar al-Sharia, tied to al-Qaida, has been implicated in carrying out the attack. The Senate report states “there were three armed members of the Libyan 17th of February Brigade militia” present and working as part of the mission’s security external detail during the attack. “Outside the compound, the security team asked 17th of February Brigade members to ‘provide cover’ for them to advance to the gate of the Temporary Mission Facility with gun trucks,” the report says. “The February Brigade members refused, saying they preferred to negotiate with the attackers instead. The Senate picture of 17th of February Brigade members refusing to “provide cover” contrasts sharply with the image of the brigade painted in the State Department’s ARB. The ARB claims the 17th of February Brigade helped American personnel escape a roadblock while fleeing the compound. The ARB recounted how the 17th of February Brigade complained to the local Libyan government on the U.S. special mission’s behalf after a uniformed Libyan police officer was caught taking pictures of the compound prior to the attack. The Ansar al-Sharia group promotes strict Shariah, or Islamic law, implementation and the creation of an Islamic empire, or caliphate. It was first to take responsibility for the attack in social media. The group later claimed it “didn’t participate [in the attack] as a sole entity,” stating the assault “was a spontaneous popular uprising” in response to the anti-Muhammad film. Witnesses told media they saw vehicles at the scene of the attack bearing Ansar al-Sharia’s logo and said gunmen taking part boasted of belonging to the group. The role of Ansar al-Sharia’s 17th of February Brigade in providing security at the compound may prompt more questions following the naming last week of senior Ansar leader Abu Sufian bin Qumu as a ringleader in the Benghazi attack. The Washington Post reported gunmen under the command of Qumu, participated in the Benghazi attack, according to a U.S. official. The Post identified Qumu as “leader of Ansar al-Sharia in the Libyan city of Darnah,” while the extensive, 54-page Library of Congress document said Qumu in 2012 was “the leader of Ansar Al-Sharia” in Libya and not just in Darnah. The Post reported witnesses told American officials that Qumu’s militia arrived in Benghazi before the attack and that the State Department was set to implicate him in the deadly assault. The information will be used in part to designate Qumu’s branch of Ansar al-Sharia as a terrorist group, along with two other al-Sharia branches, reported the Post. Qumu, formerly a driver for Osama bin Laden, was released by the U.S. from Guantanamo Bay in 2007 and was transferred to a Libyan prison where he remained until he was freed in a 2010 amnesty deal. U.S. Relied on Firm Using Unarmed Guards for Diplomatic Security in Libya…. The State Department’s decision to hire Blue Mountain Group to guard the ill-fated U.S. diplomatic mission in Benghazi, Libya, entrusted security tasks to a little-known British company instead of the large firms it usually uses in overseas danger zones. one knew how long the temporary mission would remain in the Libyan city. The cradle of last year’s uprising that ended Muammar Gaddafi’s 42-year rule, Benghazi has been plagued by rising violence in recent months. Security practices at the diplomatic compound, where Blue Mountain guards patrolled with flashlights and batons instead of guns, have come under U.S. government scrutiny in the wake of the Sept. 11 attack in Benghazi that killed U.S. Ambassador J. Christopher Stevens and three other Americans. Federal contract data shows that the Benghazi security contract, worth up to $783,284, was listed as a “miscellaneous” award, not as part of the large master State Department contract that covers protection for overseas embassies. “Blue Mountain was virtually unknown to the circles that studied private security contractors working for the United States, before the events in Benghazi,” said Charles Tiefer, a commissioner at the Commission on Wartime Contracting, which studied U.S. contracting in the Iraq and Afghanistan wars. Several British government sources said that they were unfamiliar with Blue Mountain, which is based in Wales. They said British authorities used a different contractor for security protection in Libya. Fred Burton, vice president of intelligence at the Stratfor consulting firm and a former U.S. diplomatic security agent, said he did not know Blue Mountain, but it likely got State Department work because it was already working in Libya. “They may have been the path of least resistance,” he said. Blue Mountain was able to work in Libya because it forged a business alliance with a local security firm, as required by Libyan regulations. Blue Mountain hired about 20 Libyan men – including some who say they had minimal training – to screen visitors and help patrol the mission at Benghazi, according to Reuters interviews. Some of the guards sustained injuries and said they were ill-prepared to protect themselves or others when heavily armed militants last month stormed the rented villa that was serving as the mission. They also described being hired by Blue Mountain after a casual recruiting and screening process. State Department security officials had their own concerns about some of the guards at the mission months before the recent attack, according to emails obtained by Reuters this week. One guard who had been recently fired and another on the company’s payroll were suspected of throwing a homemade bomb into the U.S. compound in April. They were questioned but not charged. The State Department has declined to comment on the company other than confirming it was the contractor in Benghazi. Blue Mountain did not respond to numerous emails and phone calls, and a person answering the phone at its office in Carmarthen, Wales, said the company would not discuss the issue. Previously known as Pilgrim Elite, Blue Mountain says on its website that it offers security services and professional training and has operated in Afghanistan, Iraq, and Pakistan. A Blue Mountain recruiter posted a notice on a security website in 2011 seeking employees with visas to work in Libya. The State Department contract for “local guard” services in Benghazi took effect in March 2012. Several of Blue Mountain’s Libyan employees told Reuters that they had no prior security training or experience. “I was never a revolutionary or a fighter, I have never picked up a weapon during the war or after it,” said Abdelaziz al-Majbiri, 28, who was shot in the legs during the Sept. 11 assault. The Libyan commander in charge of the local guards at the mission was a former English teacher who said he heard about Blue Mountain from a neighbor. “I don’t have a background in security, I’ve never held a gun in my life,” he said, speaking on condition of anonymity out of fear for his safety. The unarmed guards were told to sound the alarm over the radio and then run for cover if there was an attack, a Libyan who acted as a supervisor for the Blue Mountain local guard team at the mission said during an interview with Reuters. He also displayed a medal embossed with “Department of State” and a horseman carrying Libyan and U.S. flags. “They thanked us for our help and also gave us this medal as an appreciation,” he said. Despite their inexperience, the Blue Mountain guards said they feared the Americans were not concerned enough about security. “We used to tell the Americans who spoke to us on many occasions that we needed more support in security, because it felt thin on the ground. But they didn’t seem to be so worried, and (were) confident that no one will dare to come close to the consulate,” one guard said. Tiefer, who is also a government contracting law professor at the University of Baltimore, said the Benghazi contract paled in comparison to other State Department security awards. “This is down in the weeds,” he said in a telephone interview. Most State Department work goes to eight large private security firms with vast experience. In the late summer of 2011, after Libyan rebels took control of Tripoli, Blue Mountain guards were seen working security at the Corinthia Hotel and its sister Palm City residential compound in the Libyan capital. A United Press International report indicated that Blue Mountain and its local partner, Eclipse, also were competing for contracts guarding oil fields. Blue Mountain and Eclipse parted ways in the spring over problems with Tripoli contracts, several sources familiar with the matter said. The severed relationship may have prevented Blue Mountain from getting additional work in Libya, which required the local affiliation. Blue Mountain Chief Executive Officer Nigel Thomas, a former British special forces member, did not respond to emails or phone calls. CNSNews.com is reporting that the Social Security administration is buying …bullets? The Social Security Administration posted a blog on Thursday to explain why it was planning to purchase 174,000 hollow point bullets. The blog states that the SSA has 295 special agents who work in 66 offices across the United States. “These investigators have full law enforcement authority, including executing search warrants and making arrests,” the blog post states. “Our investigators are similar to your State or local police officers. This isn’t entirely crazy, because the SSA said they are “processing more applications than ever, which means more traffic in SSA offices,” and they are extremely concerned about employee safety, but is this not a sign of an inefficient system? If the government thinks Social Security is “fine” and people aren’t already becoming upset with the system headed for bankruptcy, even though we all pay into it every single day, then they quite possibly need to take a second look at everything. I actually understand the SSA buying ammunition for their guards, because employee safety is extremely important, but let’s look at the cause here instead of the effect.